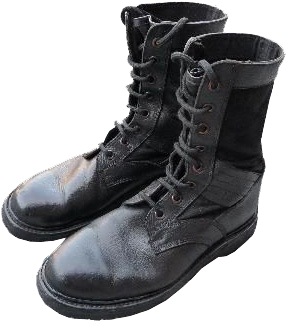 Belgian army boots for wet and hot climate ("jungle" boots) are basically correspondent to the specific "Belgian" style. 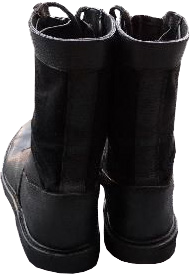 Similarly to the standard military boots of ABL (Armee Belge / Belgisch Leger), these "jungle" boots feature durable grain leather and the out-soles, which are glued and stitched. The boot's welt usually projects about a centimetre from the boot's top, providing thus the soldier's feet from potential injuries. The Belgian ABL "jungle" boot's top is made of soft but durable black grain leather. In contrast to the "jungle" boots manufactured in the USA and Germany, top upper edge of the boots and additional oblique reinforcement strips on the both sides of the boots are made of grained leather as well. The fabric elements of the boot's top are made of black Cordura (nylon) - very lightweight and breathable material. The lacing system consists of eight pairs of simple round eyelets, made of rust-proof metal. 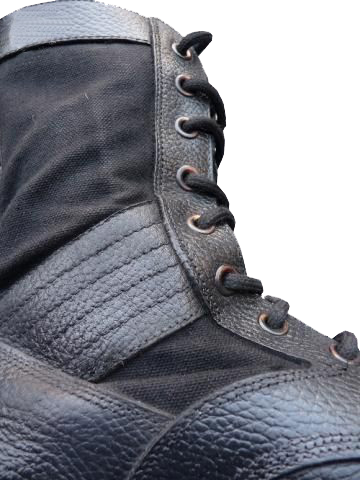 The black vulcanized rubber out-soles are of the classic "VIBRAM" tread pattern, quite common among many armies of NATO and neutral countries, from the UK and Italy to Austria and Switzerland. 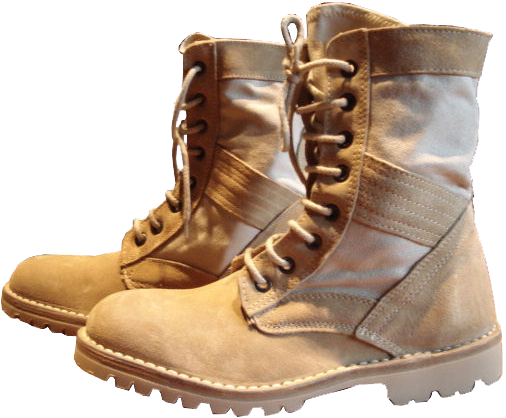 There are several types of Belgian military boots for hot and dry climate ("desert" boots). The oldest version is very lightweight, made of suede and canvas. 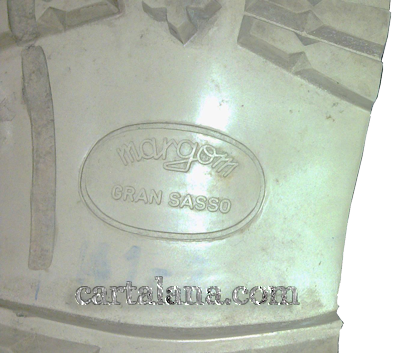 The tread pattern of the out-sole is standard Italian "VIBRAM" design, and out-soles of these boots are manufactured by "MARGOM srl", an Italian company , located in Caronno Pertusella, a Lombardian town to the north-west of Milan. In general, they are made similarly to the black "jungle ABL" boots, with the out-soles glued and stitched along the welt. The lacing system consists of eight pairs of round eyelets. The top edge of the boots and additional oblique reinforcement strips on the both sides of the boots are made of natural leather (suede) instead of nylon, which is used in German and American "desert" boots. In such a way, the main difference between these two types of boots ("jungle" and "desert") is the colour and type of leather used. Later models of Belgian "desert" boots have undergone several changes. By their appearance, they began to resemble Danish"desert" boots (model R0001), manufactured by "LeBock" footwear company. 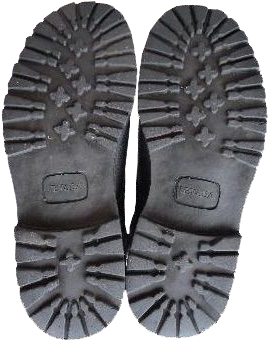 The out-soles of such boots are made of nitrile rubber and are actually of the DMS (Direct Moulded Sole) type. 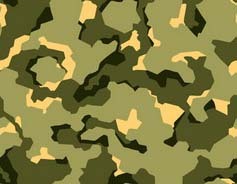 The tread pattern is a variant of the ones, used in the standard Dutch army models of the 1990s.